I never thought I’d experience a bigger cooking disaster than the chicken-fried steak incident of ’01. I’m not going to get into details because you’d probably vomit, so I’ll just say it was the only time The Joy of Cooking steered me wrong. Last night, though. LAST NIGHT. I tried to make breakfast for dinner, featuring the humble waffle. I found a new recipe that I was super excited about trying. It can be difficult to find a good waffle recipe because it needs to be gluten free and dairy free for me. I thought I had found a good one. It turns out I did not. Now, I should have known something was fishy when the recipe required me to use three cups of almond flour and one cup of coconut flour. I’ve been doing the gluten-free thing for over a year, and I have learned through experience that I do not like things made exclusively out of almond and/or coconut flour. They taste blech. But for some reason I went temporarily insane and thought it wouldn’t matter and everything would be okay. So after spending $18 on flour at the grocery store and using six eggs, I mixed everything up and plopped it onto the waffle iron. Things went further downhill when I noticed that the batter was starting to slowly ooze out the sides of the waffle iron. I tried to wipe it away, but as soon as I did, more batter started oozing out until it was a volcano of gluten-free waffle batter flowing all over my countertop and, eventually, my floor. But I kept wiping it, over and over again, because, $18 and this was dinner. There was no backup. I put down the lid and told myself if I just cooked it a little longer, it would miraculously turn into an edible waffle. I STILL wasn’t willing to give up because THIS WAS DINNER AND $18 so I started to scrape a little off the waffle iron and taste it. I thought maybe I could feed us a pile of waffle crumbles and it would all be fine. I tasted it and it was not good, to put it mildly. I had my kid taste it. Please know that this kid will eat anything. He has literally ordered an octopus tentacle at a restaurant and ate it up yum. But my waffle tidbits? He put a piece in his mouth and SPIT IT OUT. Wouldn’t even swallow it. He said that now he knew how sponges were made. As I write this, I can still hear him retching from the other room. Freaking waste-of-my-time stupid gluten-free waffles. I didn’t know it was possible to hate a baked good. My kids are into this thing where they make up their own snack/breakfast/meal/etc. and then get somebody to judge which of their creations is better. I am usually that judge. Most of the time it’s okay. Nothing too crazy — toast sticks dipped in buffalo sauce, double stackers (honey and peanut butter sandwich on a pita, warmed up in the microwave and topped with powdered sugar), etc. What was it? Three words: Popcorn. Nutmeg. Cayenne pepper. My other kid’s creation was called a “Uranus ball” (pronounced exactly how you think it’s pronounced). It was a ball made of rubber bands floating in a mug full of water. I think they’re trying to poison me. I was eating my lunch without a care in the world and finally came to the last remaining lettuce leaf of my salad. I ate it, chewing, talking, laughing, having a grand old time, when I happened to look down on my plate. That’s when I saw it: A dead yet fully intact lady bug on my plate with salad dressing on top of it. But then I realized, no, there’s is no other way to read this situation. I said aloud to my friend, “There’s a LADYBUG on my plate!! !” She looked over, saw said ladybug, and honestly, I can’t even remember what she said because I was so stunned. And nauseous. To which I replied, “Yes, I suppose it’s like finding a puppy,” which makes no sense whatsoever but at the time I was mostly concentrating on trying not to puke so being able to get words out was just a bonus. I then added, “Yeah, what if it was a centipede?” which made me even more nauseous and I decided I needed to be done speaking of this. Needless to say, the server was shocked and very apologetic. He wouldn’t let me pay for lunch. The hostess said she hoped I would still come back. I said I would, but all I could think about was how I needed to disinfect my tongue with a Wet Wipe ASAP. I’m getting to a point in my life where if I don’t write something down, I have no idea what I’m supposed to do. Who am I kidding — I’ve reached that point as of today. I paid some bills this morning and needed to mail them out. I had some errands to run, so there’s a mailbox near my house that I drop stuff into when I’m out and about. I grabbed the bills on my way out intending to mail them on my way to Bed, Bath & Beyond (where I had to purchase a nonstick skillet since I recently threw all mine away since they’re supposedly toxic, but then when I tried to cook anything in my new stainless steel pans everything sticks like a nightmare so I had to go buy nonstick again and have no choice but to continue to poison us all slowly through the years). So I turn onto the street and…drive right by the mailbox without mailing my stuff. I ran my errands, determined that on the way home I’d mail the bills. When I was finished with my last errand, I even forced myself to hold the envelopes while I was driving so that I wouldn’t forget. I mean, they were RIGHT IN MY HAND and it was annoying to drive like that and the entire time I kept thinking about how uncomfortable I was but damn it I wasn’t going to forget again. So I’m getting closer to the mailbox. I turn onto the street. I start thinking about how I need to take a class on how to make pies. It’s hard for me to make pie dough and I start to wonder if I should make an apple pie today, even though it’s not really apple season, but who cares because who doesn’t like an apple pie ANY time of the year? And then I drive right past the stupid mailbox. Bills in hand. I literally scream, “What the f*%& is wrong with you?! ?” to myself inside my car. It’s ridiculous. I just need to FOCUS. And not on pies. Last night I had to go to my kid’s school to learn all about an assembly he’s having next week entitled, “Growth and Development Lecture,” a.k.a. let’s talk about puberty. I literally can’t even go into it. It was that traumatizing. So instead I’ll focus on the lasagna I made for dinner. I even had him look it over while I was still at home to ensure that he knew exactly what he was doing. I ignore it. I have made a flow chart so that HE DOES NOT HAVE TO MAKE EXECUTIVE DECISIONS. A few minutes later I receive the text “Disaster, still not bubbling” along with a video of the lasagna actually cooking in the oven. I’m assuming he did this to prove to me that there was, in fact, no bubbling going on. Honestly, I did not need this. I had a lot on my plate at that moment and it involved being prepared to answer questions like, “Help, I think I’m growing breasts even though I’m a boy. Is that normal?” and God help me I HAVE NO FREAKING CLUE what the answer to questions like that are. Anyway, I got home to find that the lasagna was fine. My husband had the audacity to ask me how it tasted like HE was the one who made it when all he did was take it out of the oven. It was a very rough two hours. I’ve had a very trying 24 hours. You see, lately I’ve had an obsession with oatmeal – cooking it, eating it, accessorizing it with fruits and sugars and all sorts of things. I found a recipe for “overnight oats” on the internet. You put oatmeal in a slow cooker with all sorts of stuff, set it to low, and in the morning you’re supposed to have hot, delicious oatmeal with zero effort. 1. You can’t overcook it — seven hours is the max, otherwise it will burn. These problems played out like so: I wake up around 7 am, so I’d have to put the oatmeal in the slow cooker around midnight. I didn’t think that was ever going to happen, yet I found myself at 11:30 pm running around the house like a maniac mixing up oatmeal and almond milk and diced apples and brown sugar. I literally could not go to bed until I accomplished this. I HAD to make this oatmeal. 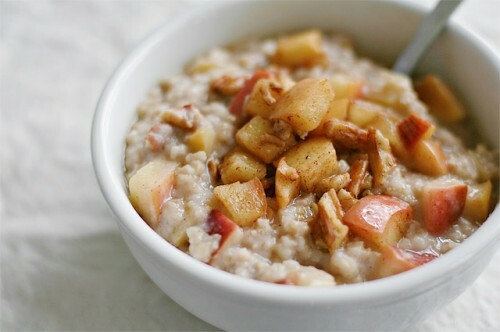 The whole point of overnight oatmeal is to make things easier in the morning and less stressful. The opposite happened for me. I woke up probably 11 times in the middle of the night insanely worried that the slow cooker would catch on fire and burn the house to the ground. I laid there in bed debating whether the oatmeal was cooked through enough for me to run downstairs and shut off the slow cooker at 2 am. Then 3 am. Then 4:30 am. The slow cooker became my albatross. What?!? After all that work and worry? Then I tried it. Apparently using 1-minute quick-cook oats is not the same as using regular old oats. The oatmeal I had slow cooked all night long was basically slop. With apples chunks. It was awful. I was horrified and completely beaten down. Overnight oats, you are my nemesis. You’ve messed with me for the last time. Halloween has come and gone. The kids are back at school. Their overflowing bags of Halloween candy are not. They are sitting here all day, with me, in the house. And that’s a dangerous combination. Oh! Reese’s Peanut Butter Cups! My favorite! I’ll just have one. OMG, that was amazing. It can’t hurt to have one more. I mean, they’re SNACK size. And this is my snack. (Two hours later) It’s been two whole hours and I haven’t had any more peanut butter cups. Go me! I think I’ll reward myself with another one. (Later that night) ONE more peanut butter cup surely won’t make a difference. I’ll just grab one more teensy weeny one. (Desperately rummaging through the bag) Oh no! There are no more. Let me attack Kid #2’s bag. He’ll never know. (Finding one) Victory is mine! (The next day) No more peanut butter cups. I guess I’ll move on to Mounds. (Later that day) No more Mounds. I guess I’ll move onto Snickers. What the heck? Fun-size Snickers are now BITE size Snickers?!? That’s crazy. I need to eat at least three to equal the old Fun Size. (The next day) Ugh. I guess I have no other choice but to eat a stupid Nestle Crunch. It’ll do in a pinch. (By the end of the week) I HATE these Tootsie Rolls. But I’ve eaten everything else. Ugh. I’ll hate every bite. But I have to do it because my body needs candy. Going. Through. Withdrawal. I think somebody needs to offer me that Switch Witch thing. 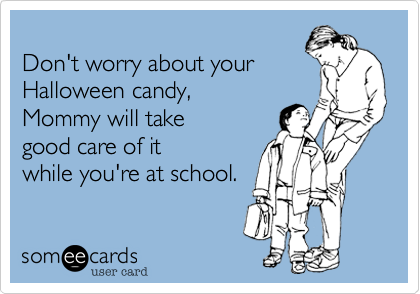 I might trade all my kids’ candy for a sweater or something. Maybe. I’ve been MIA lately because I’ve been traveling abroad. I went to Germany, and I could have just said that, but I prefer “traveling abroad” because it makes me feel like I’m living in a 19th century novel. My husband and I were lucky enough to visit Munich and then Heidelberg. It was super duper fun. What stuck out to me most during our adventure? The castles? The culture? The history? Germany is not fooling around when it comes to desserts. We went to a restaurant that served, get this, a pre-dessert, a dessert, and THEN A POST-DESSERT. What?!? Yup, you heard me right. THREE desserts, all at the end of one meal. It was spectacular. Amazing. Mind blowing. I don’t have a photo of the pre-dessert because I was so flustered I just ate it without documenting it. FYI, it was sorbet with some kind of cheese and some other stuff. That white blob is an ice-cream-like concoction that’s frozen even colder than ice cream is. And the fruit, well, I have no idea what that was, but it was good. A chocolate mousse-like-thingie with burnt caramel on top. That macaroon on the bottom has gold on it. GOLD. Unfortunately, gold is pretty much tasteless. And on top of all that, I had BREAKFAST DESSERT and LUNCH DESSERT. How insane is that? 1. My husband and I unanimously agreed that this meal needed to be blogged about. 2. Our server asked me if I liked the gnocchi and I screamed, “OMG! It’s so amazing I’m taking a picture of it!” and afterwards I felt embarrassed. 3. My husband and I both sat there in silence, eyes closed, chewing our gnocchi so as to not be distracted by our other senses. 5. We stopped talking and ate some more with our eyes closed.